Gel Cell batteries have become very popular in the last few years, rapidly dropping in price to a level that experimenters can afford to have several batteries in their collection. To maximize the life of your Gel Cell battery, it is imperative they are charged and maintained correctly - overcharging or undercharging will result in a drastically shorter battery life. The GCC01 Gel Cell Charger utilizes a highly accurate and effective solution, which will fully charge 12v Gel Cell batteries and indefinitely maintain your cells on a float charge. This will also allow you to leave your battery pack connected to the charger without worrying about overcharging. 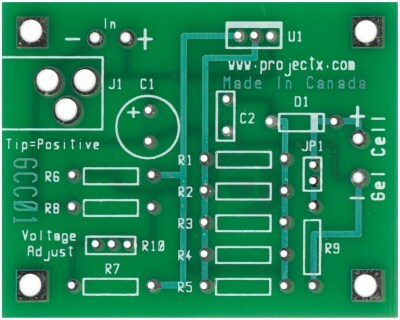 The GCC01 is a high quality, double sided, glass epoxy PC board, complete with solder masks on both sides of the board and plated holes along with a high-contrast silk-screen labeling component positions. Board size is a compact 2 1/2" x 2" (63.5mm x 80.8mm) ready to fit into standard size project cases. The GCC01 board requires only a minimal number of components to function. The board includes power supply connections along with battery connections to attach to your gel cell battery. Construction, technical and schematics are available for download in PDF format. 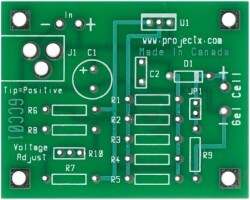 The GCC01 board is available as a bare PC board or with a complete parts kit. It is available to be ordered online.